Situated in northern Orange County, Placentia Presbyterian Church has a rich history that dates back over 100 years. Services at the church offer a combination of the traditional and contemporary and feature a broad range of musical styles depending on the occasion and time of year. 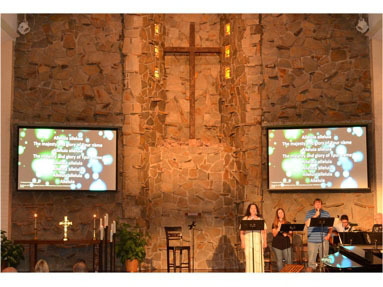 In its ongoing effort to further engage all members of the congregation and, in the process, make services even more relevant, church management recently elected to incorporate video projection technology. This led to the deployment of two LC-WXL200AL LCD projectors from Rancho Santa Margarita, CA-based Eiki International, Inc.
Christian Sound Services of Long Beach, CA, a design / build firm that specializes in the installation of audio, video, and lighting systems for the worship market, was contracted by Placentia Presbyterian Church to handle the project. Rod Stoddard, the firm’s owner and principal consultant who was also responsible for system design and oversight of the installation, discussed the job and his reasons for selecting the Eiki projectors.